I don’t believe I have a drop of Irish blood in me, and I don’t feel Irish come St. Patrick’s Day. But I can appreciate having a day to celebrate Irish culture in whatever way you see fit. For me, of course, that’s with food. Lots of Irish recipes, especially by way of America, are quite heavy and meaty so I wanted to do something simple, vegetarian, and budget-friendly. Enter braised cabbage, sans bacon (I know, sacre bleu!). All it takes is a head of cabbage (one of the least expensive vegetables I know), a knob of butter, a bit of broth and salt and pepper. Part of the brassica family, cabbage is one of my husband’s favorite vegetables. We make cabbage salads often, like this Asian Cabbage Salad from last week, “health salad” inspired by the Second Avenue Deli, or shredded red cabbage salads with lots of veggies and feta. But it’s not often that we cook cabbage. Maybe it’s the childhood sense memories it evokes of our upstairs neighbors boiling the heck out of cabbage on Saturday afternoons, but I never wanted to mess with the clean, cool crunch of raw cabbage. But I was mistaken. 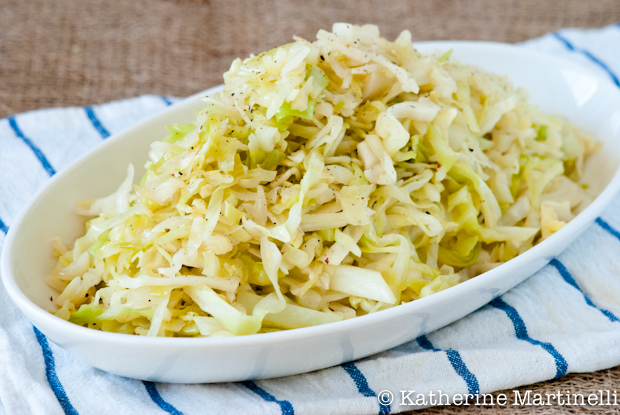 This braised vegetarian and gluten free cabbage recipe couldn’t be easier and, although there isn’t much butter compared to the heft of the cabbage, the resulting flavor is incredibly buttery and smooth. I cooked the cabbage until wilted but not soggy – you still want some bite there. 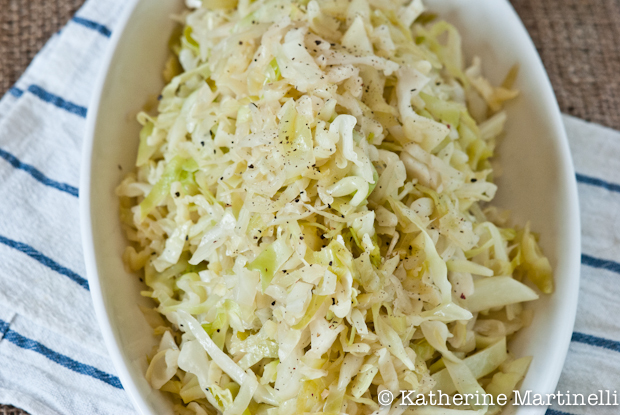 Although we ate it on its own with a non-cabbage-based salad, braised cabbage makes an amazing side for just about any meal. I imagine it being delicious alongside roast chicken, and of course cabbage has an affinity for pork. Or, keep it vegetarian by serving it with seitan or marinated tofu. I threw some of the leftover braised cabbage into soup, where it added body and flavor, and I also think it would be great with pasta. Just saying. Enjoy this Irish gluten free and vegetarian braised cabbage to celebrate St. Patrick's Day, or just as a delicious, budget-friendly side for your meal any time of the year. Melt the butter in a wide-rimmed pan over medium heat. Add the onions and cook until soft. Add the cabbage and toss as best as you can. Pour the broth over and cover. Simmer gently over low heat for about 30 minutes, or until the cabbage is wilted (about halfway through toss gently). Remove from the heat and toss again. Toss in another small pat of butter, if you like. Season generously with coarse salt and pepper and serve. To make parve and vegan substitute a non-dairy butter alternative like Earth's Balance. 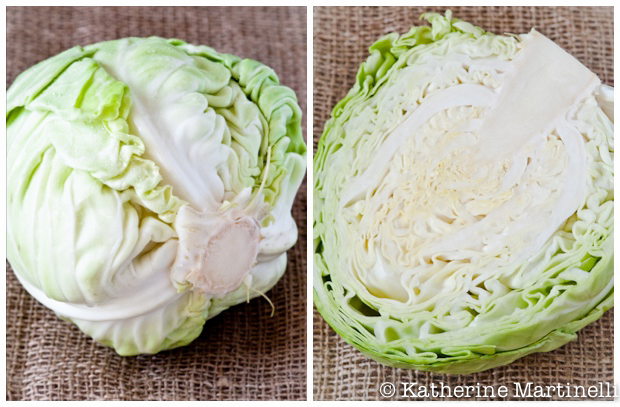 Katherine – I am half awake and thought it was a Cabbage blog hop. I just submitted my cabbage recipes and saw it’s St. Patty’s Day lol! Feel free to delete what doesn’t belong – sorry! Your braised cabbage dish is beautiful! I’m definitely giving it a try. Also pinning it! Thanks for sharing and for hosting the party. I love your braised cabbage! I have it every once in a while, but mine is different. I love the simplicity of yours and will have to try it next time I cook up some bratz. I usually serve cabbage with sausage which is the only way I can Bobby to eat it. Thanks for the recipe and thanks for the hop! Have a wonderful weekend! The cabbage looks so good at the farmers market right now-I will have to try your recipe! Cabbage takes so well to braising! It develops a much more interesting flavor (much more mellow, yet somehow more intense) – great way to make an unglamorous veggie more glamorous! I’ve not braised shredded cabbage before, but like the idea. I’ll bet some caraway seeds would be wonderful in this. Good stuff – thanks. That cabbage looks fantastic! Thanks for hosting!! I’ve been absent for a month or so due to way too many things to mention here. But thank you so much for your weekly reminders to come and join your blog hops! I’ve never had braised cabbage before and truly have never eaten Irish food! But I need to try your recipe some day because I LOVE cabbage! I brought a lovely green Caesar Salad to your party! I’ve only every made braised red cabbage (with orange juice) – love the sound of this simple green version! The most easy cabbage recipe I have had in my inbox all week 🙂 ! Thus it will probably be the one which stays and gets cooked!! Actually I love cabbage [with a N European background how could I not ?!] and i know this will fit in everywhere . . . happy Paddy’s Day! Hope you raise the glass if not with stout perchance something equally delectable!!!!! I love cabbage and am always looking for new ways to use it. This sounds great! YUM! I added matchstick carrots half way through and it turned out great! This is my first St Patrick’s Day as a vegitarian and your recipe was just whay I needed to see! The cabbage was always my favorite part of the corn beef dinner anyhow. This cabbage recipe when I tried at home was not really appreciated by my family but it was really yummy too. Thanks for sharing this delicious preparation. Keep posting wonderful recipes like this.